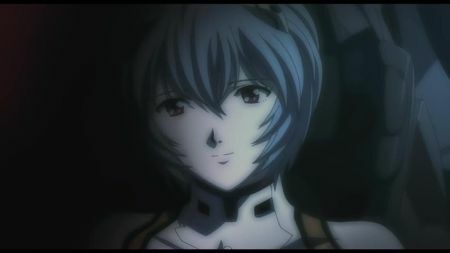 Teh Rei, in all her 1.01 beauty. It’s amazing how easy it is to slip back into Evangelion. I haven’t watched the series in a couple years, but the sights (Shinji on the fog-shrouded mountain is still iconic to me), the sounds (hello cicadas), everything is as clear as the first time you saw it. Really, Rebuild of Evangelion is a treat for Eva fans. One can enjoy it without being familiar with the series, but for those already familiar it’s just pure, perfect nostalgia, like coming back to an old friend after a long time. Rebuild of Eva 1.01 is an almost perfect compilation of the first six episodes, so the overall plot is very familiar, but it’s the little things that make it fun. The movie opens with a view of the blood red sea, conjuring up images of the End of Eva and really setting the apocalyptic tone of the series even more. Tokyo-3 is really a literal fortress here, with every building hiding masses of gun turrets and missiles. Shinji still has that stupid tape player, even after all these years, and the movie goes to a constant effort to show Shinji in his headphones, emphasizing early on his social anxiety. 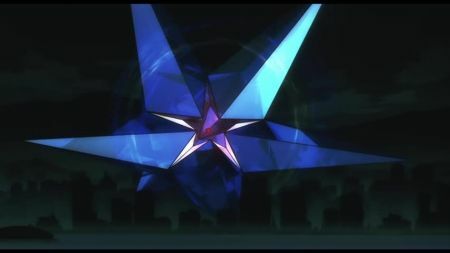 The real joy is the Ramiel battle, with Ramiel’s constant geometric shifting and lasers a real feast for the eyes. Operation Yashima is rendered all the more impressive in its scale, and rightly serves as the climax of the film. The CG was mostly rendered well throughout, and my only complaint with the animation is that the night time scenes appeared exceptionally dark, but that might of been my monitors fault. 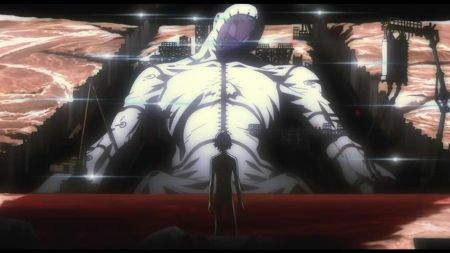 So, what would a good eva movie be without throwing some mindfuck at its audience? Rebuild features a couple such occasions, with Misato showing Shinji a nailed Lilith underground with the Sachiel mask instead of the Seele mask. And then, at the very end, Kaowru is woken up on the moon from a coffin in front of a lilith-giant with the Seele mask, who might be Adam. Talk about confusing. I thought a very cool touch was also where, after Eva-01’s hands are burned by Shamiel, they appear perfectly human under all that armor, complete with nails. The trailer for the second movie is even more tantalizing, promising unique versions of Eva-05 and 06. Who cares about the glasses girl. I want to see those other bad boys in action. The wait between these movies is really going to kill me, especially if they start pulling out some epic twists and turns. And, frankly, who else is disappointed in the lack of the original OP and ED? Utada Hikaru is good and all, but I need some “Fly Me to the Moon” to complete my perfect Eva experience, cause, really, what is Evangelion without Frank Sinatra? Just a bunch of emo pilots in out-of-control robots, that’s what.